The Rooting Practice is very important in the Universal Tao System. Rooting can be compared to the foundation of a building. The stronger the foundation, the higher the building may be built, and the more difficult it is to topple. After mastering the Rooting Practice you will feel, as you walk around, stand, or sit in your daily life, that you are more in touch with the earth. (Fig. 3.68) You will feel more stable and practical minded, not "spacey". 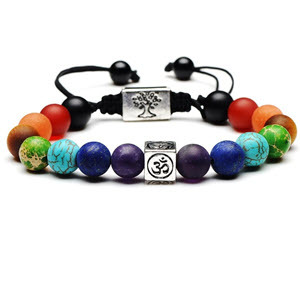 Many Universal Tao students, after practicing Iron Shirt Rooting for a while, find that they have good balance and greatly improve the quality of their physical activities, such as running, skiing, tennis and Yoga. Rootedness serves the soul the soul (Chi Body) and spirit the way a control tower serves a space rocket. The more you can root to Mother Earth, the more balanced the energy will be. Taoist Practitioners are very concerned with rootedness. The more he or she can root to Mother Earth, the more balanced the energy will be. 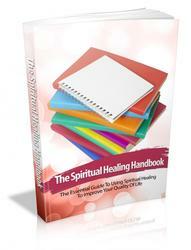 Such a balance of energy increases healing energy. In advanced practice, rooting is required to perform the practice of the Thrusting Channels and Belt Channels. Tai Chi, the Healing Hand and the higher spiritual practices draw upon the earth energy, as well as heavenly energy, to transform life-force energy into spiritual energy in order to give birth to the soul and spirit. It is the earth energy which helps the soul and spirit grow. Astral traveling requires rooting, and this earthly rootedness serves the soul and spirit the way a control tower serves a space rocket. Those who try to bring Chi up to the head, or receive heavenly energy without grounding in the earth, become "spacey" instead of "in tune" with their experience. Always balance out by using both sides of the body during practice. Developing the Rooting Practice requires two people: one to push and the other to stand. This exercise will greatly improve your stance. Many people will find that one side is weaker than the other or the upper part, such as the neck, is weaker than the lower part. Practice on the strong side first and then the weak side so that you will have a reference for improving the weak side. Gradually you will grow stronger and it will require less effort to maintain your structured position because you will have built extra muscles and strengthened the tendons, tendon attachment sites and fasciae as one structure. When you "root" properly, it feels as if you are sucking the ground, or have grown a deep root into the earth. This is because the whole structure, as a unit, is pressing into the ground. You can feel the entire bone structure sink down to the ground. With practice you will be able to bring energy along the prescribed course more quickly and easily To test your rootedness, find a partner who can push you while you hold the structure. The purpose of the Iron Shirt Rooting Principle is to line up the bone structure with the joints to feel the whole body become one piece. Once you become proficient in the practice, you will position yourself in the proper structure quite easily. Stand in the Iron Shirt Horse Stance. Sometimes you can stand with the feet at a slightly wider position. However if the feet are too wide apart, you have to use muscle strength to hold the whole body together. 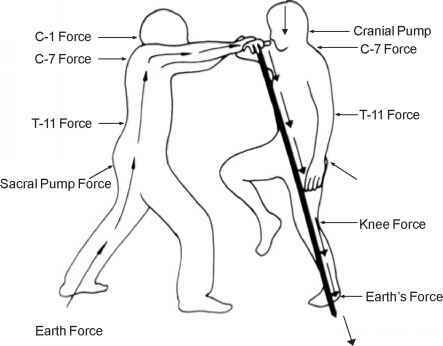 When the force comes, the muscle will hold the force and knock the alignment off. If the position of the feet is too narrow you will be using the tendons' force to help hold the structure together, affecting alignment as well. When your partner pushes you with force, your neck must be relaxed so that the force will not go into the neck, causing pain there. 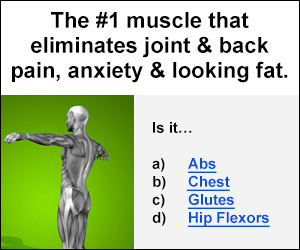 Your structure, inner organs, and tendons, muscles and fasciae must work as a whole to hold the position. This will gradually increase your inner strength. Packing Chi into the organs is very important in the practice of rooting. It is particularly important to pack Chi in the kidneys and to join the kidneys and K-1 (Bubbling Springs) into one line. The navel and the two kidneys must join together feeling like a large belt, belted across your waist. (Fig. 3.69(a)) The joining of the navel, the sides of the waist, the two kidneys and T-11 with Chi energy is basic to the rooting principle and is called the "Chi Belt". 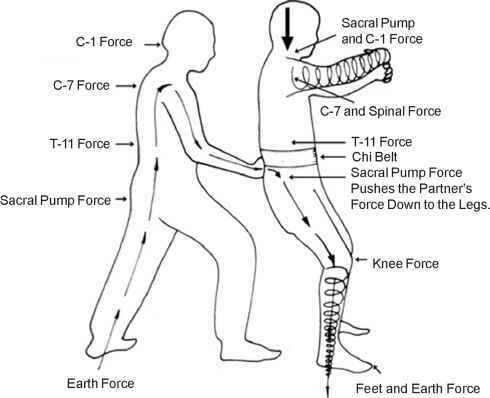 Without the Chi Belt, the major connection of the upper and lower energy joints, the structure and Chi will be lost. To develop the Chi Belt, first pack Chi in the kidneys and the navel, expanding first from the left kidney out to the left waist, then towards the front to the navel. Expand, pack and wrap the right kidney to the right waist, and then forward to the navel. This joins both sides together at the navel. 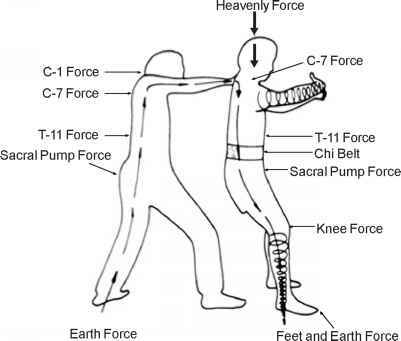 As the Chi Belt expands, it connects to the T-11 and the Door of Life. The navel now feels like a full blown tire encased within a big belt. Once you experience a Chi Belt in the rooting practice, you will be able to attain rootedness quickly and will not need to use your muscles to join your structure together Therefore, mastering the Chi Belt will help you to be very relaxed in your practice. 3. Principle of Rooting a. Assume Embracing the Tree. b. Sink the energy down to the lower navel area. c. Sink down as comfortably as you can, and open the groin by slightly separating the knees. d. The toes turn slightly inward. When the knee caps are locked (meaning that the knee joints are held tightly), the knees will lock in the ankle joints like the position assumed when you are sitting astride a saddle. Sink into the knees. You can feel the connection between the knees and the ankle joints and the connection down to the feet. Feel your whole body weight drop down to the ground. 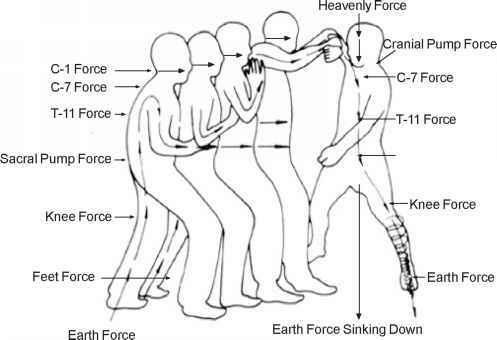 The force passes through the bone structure. (Fig. 3.69(b)) Feel the bones like sponges that absorb the force and direct into the ground. e. The hands are at shoulder level, the elbows sink. Feel the force of the sinking elbows pressing into the bone structure. If the elbows are up, you will disconnect from the tendon power. 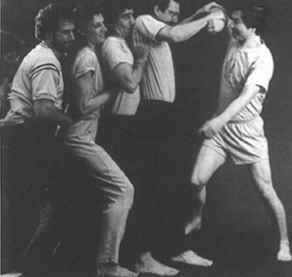 (a) Chi Belt joins the whole body (b) Press down and turn the knee outwards structure together. to screw the force into the ground. f. Line up the shoulders, joining the scapulae with the spine by rounding the scapulae and sinking the chest. Connect through the hip joints down to the knee and ankle joints. Line up the shoulder joints by pushing the thumbs out and the pinky fingers in, feeling the tendons pull. The wrist joints are connected to the shoulders. Relax the neck, especially the trapezius muscle, so that the connection does not go up to the head which will bring force to the neck. Otherwise, when your partner pushes you, you will feel like you were hit by a two-by-four and it will knock you over. When you relax the neck and join the shoulders with the spine, the force travels down the spine and down to the ground. To connect the shoulder joints with the spine, you need to round the scapulae and sink the chest so that the force can be transferred from the shoulders to the scapulae. Then, push the neck straight and the T-11 out. Keep the sacrum straight without moving the hips, until you feel the spine as a flexed bow full of strength. All becomes one line. When the groin area is open, the hip joints will join with the knees, the feet, and all will join down with the ground. Feel the Chi Belt, belting the waist and joining the entire structure together. Having a partner push against you can increase your rooting power and thus strengthen the fasciae and spinal cord, increasing the function of the sacrum and cranial pump. Assume the position for Embracing The Tree, and pack with air as described. Your partner should then push (not hit) his fist against your sacrum, T-11, C-7, and the base of the skull, respectively. It is important that these four centers become strengthened and linked together into one line. If they are not linked, they become many unconnected lines, and the partner's force will not travel down to the ground properly. The spinal cord is the house of the nervous system which joins all the other parts of the body. The spine consists of many bones which are put together and held by muscles, tendons and fasciae. Most of the exercises are not to strengthen the spine solely, however Iron Shirt Chi Kung is designed to strengthen the entire bone structure, especially the spine. Many people have weak spines which cause bad posture, breathing problems and weak organs. Weak organs are the original cause of a weak spine. Poor posture becomes a vicious cycle: organs are kept weak because Chi cannot circulate throughout the various body systems. 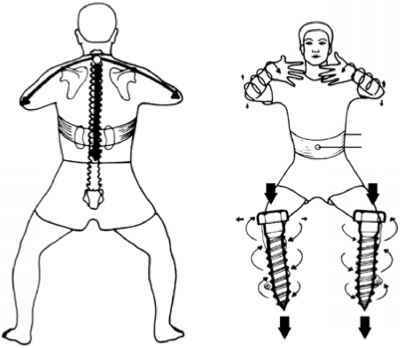 Iron Shirt (1) protects organs which generate vital Chi; (2) recharges them with packing; (3) circulates Chi up the spine and strengthens the nervous system; and (4) creates the storage space for the Chi energy by burning out fat. The sacrum is the very important pump that moves Chi into the spine. Assume the Embracing the Tree stance. Be aware of your sacrum, pack with Chi, develop a Chi Belt, and have your partner put his fist right on the sacrum. Slowly tilt the sacrum to the back, pushing against your partner's hand, with very little movement from the hip. Have your partner push you as much as you can withstand, without being pushed over and gradually increase the push until you grow more powerful in the sacrum area. Hold this position for one to two minutes. Breathe normally. Be aware of the force of your partner being transferred from your sacrum to the legs, to the feet and to the toes. You can exert force from the toes back up the feet to the heels, to the legs and to the sacrum. When your partner releases you, rest for a while and feel that the sacrum is open and feel how the Chi flows up the spine. When you are advanced in the practice, you can be very relaxed. There is no need to pack. Simply feel the force pass from the sacrum to the ground, and feel the ground force come up to resist the force through use of the bones. Do not lean towards your partner. T-11, or the eleventh thoracic vertebra (the point of the adrenal gland and the kidneys), is regarded by the Taoist as a pump which aids in moving the energy to the upper body. Assume the position for Embracing the Tree, and pack with Chi as described. Your partner then pushes his fist against T-11 as you press back with that area of the spine. The work is done by the spine, not by the whole body. (Fig. 3.71) Do not lean towards your partner. Fig. 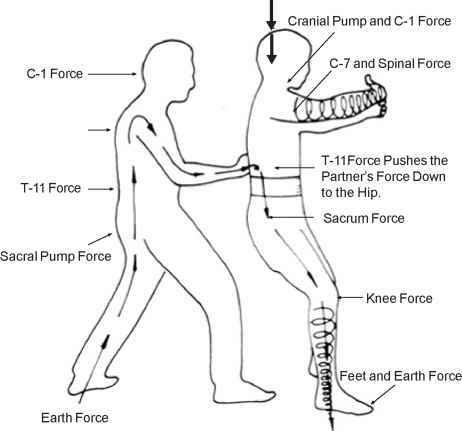 3.71 Partner's force is transferred down to the ground through the bone structure by the force of T-11. C-7, or the seventh cervical vertebra, is considered the point at which all the tendons of the body join together. By strengthening this part, the tendons, the fasciae and the neck will be strengthened. The C-7 also is the junction point of hand and spinal cord power. Assume the position for Embracing the Tree and pack with Chi pressure as described. 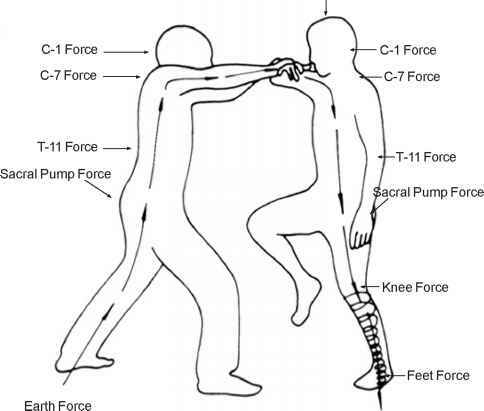 Your partner then pushes his palm (not his fist) against C-7 as you press back with C-7. Hold this position for as long as you can. (Fig. 3.72) Your partner should coordinate with you when you are ready to release. Fig. 3.72 Partner's force is transferred down to the ground though the bone structure by the force of C-7. The cranial pump has long been regarded by Taoists as a major pump for the circulation of energy throughout the body. It has been previously mentioned that minute movements at the joints of the eight cranial bones occur during breathing. Cranial movement stimulates the production and function of the cerebrospinal fluid surrounding the brain and spinal cord. The cerebrospinal fluid is necessary for normal nerve and energy patterns in the entire body. Strengthening the cranial pump can increase energy and alleviate symptoms such as headaches, sinus problems, visual disturbances and neck problems. Assume the stance for Embracing the Tree and pack with Chi energy as described. Your partner stands to one side of you, placing one hand on your shoulder and the other on your hip. Your partner pushes you lightly, gradually increasing to full force. If you are well-rooted, the force of the push will flow right through your bone structure, down to the feet and into the earth. (Fig. 3.74) If you have learned to direct and absorb energy through the bone structure and into the soles of the feet, you will be able to receive the powerful healing energy created by the blending of your energy, your partner's energy and raw earth energy. Your practice should have acquainted you with the flow of energy that goes down through the feet into the earth and then back out of the earth, up through the feet into you, while at the same time you are using the rest of the foot to "claw" against the floor. Front rooting is primarily training the front structure to root more solidly to the ground, especially the hands, the ribs, the front of the legs, and the soles and toes. Many people will find it hard to do any rooting to the ground at all. 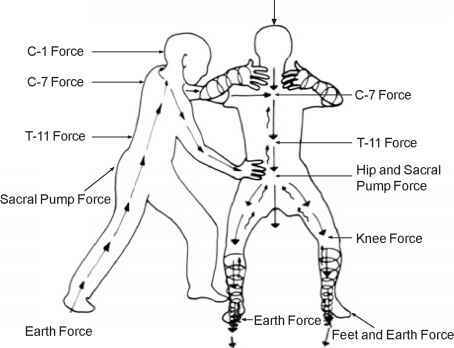 You must feel the force of your partner pass to the shoulder, to the scapula, to the spine, to the sacrum, to the hip and to the leg as one line. Assume the Embracing the Tree stance. Your partner pushes you on both wrists with both of his palms. (Fig. 3.76) Front rooting is very hard and takes a lot of practice. In the beginning it is difficult, so apply only a small force and gradually increase. This will open the leg channels and hand channels and join them together. C-7 and the spinal cord play a very important role in the front rooting practice. 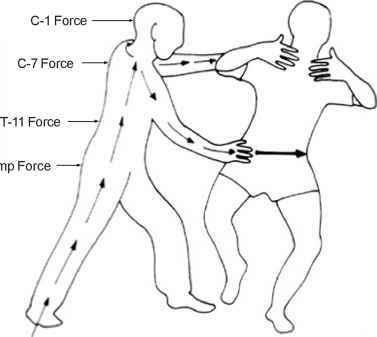 C-7 and Spinal Force Pushes the Partner's force down to the Hip. The arm, the scapula, the spine, and the leg become one line, similar to a stick sticking into the ground. (Fig. 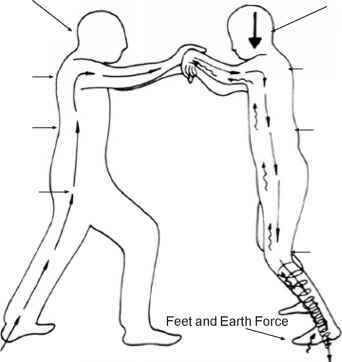 3.78) If you try to push on the end that is sticking into the ground, all the force is transferred to the ground. If the fasciae and tendons are not as strong as possible, the whole structure will break when pushed. Fig. 3.78 Force transfers though the bone structure as it would through a stick sticking ino the ground. e. Rooting against People—Force Transferred by bone structure to the ground. When your partner pushes you, do not lean towards him. Trust your structure and feel the whole body join into one piece. Feel the bones like sponges absorbing the force and passing it along the bone structure to the ground. 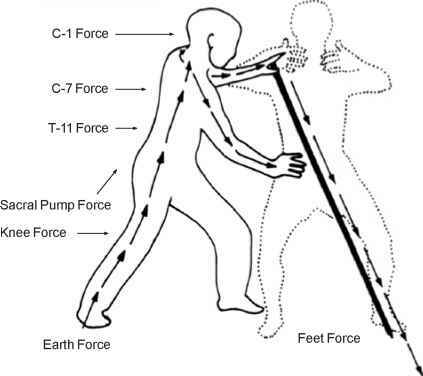 When you feel the force, open the knee a little and feel the knees connected to the earth. Feel the energy pass to the ground. When someone pushes you, he passes the force to you. The tendency as your partner pushes you is to counter the force by pushing the elbows out. This action moves you out of alignment. Therefore, when you feel the energy come at you from the side of your body, keep the elbow down and redirect the force back to the scapula and to the spine. The force, then, will not push you out of alignment. When you are good at aligning all of the joints together, no matter where the force directed at you comes from, you will be able to redirect it down to the earth, rather than let it break your alignment. How to bring chi from bubbling springs thru dantian to limbs?